Hideaki Ito monkeys around in Uzimaru. The Skinny: A group of trainees try to become emergency rescue divers in this polished, feel-good action movie that hits far more often than it misses. Although the film is saddled with a somewhat predictable storyline pulled straight out of a Jerry Bruckheimer popcorn flick, Umizaru succeeds in no small part due to its endearing, largely humorous portrayal of its lead characters. Review by Calvin McMillin: Based on the popular manga of the same name, Umizaru (literally "Sea Monkeys") is a winning action flick that borrows liberally from the Top Gun formula, only this time around, the pilots have been replaced with rescue divers, and the locale has been changed to Japan. Still, it's not exactly a lifeless carbon copy transported to Japanese shores. While first-time director Eiichiro Hazumi does reenact more than a few genre conventions pulled from countless Hollywood films, he somehow succeeds in giving Umizaru a pulse all of its own. The story kicks off when fourteen young men decide to become search and rescue divers for the Coast Guard. Each of them claim to possess a noble desire to help people, but in most cases that's a lie - simply put, the rescue diver position is a prestigious gig that'll help them achieve any number of personal, often shallow goals. Still, being a search and rescue diver is a highly dangerous job to take on and applicants are subject to a series of grueling training sessions to qualify for the position. 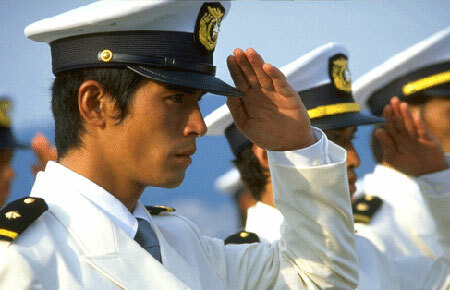 Naturally, like Full Metal Jacket and an Officer and a Gentlemen before it (and numerous other films with a vaguely militaristic bent), Umizaru introduces viewers to a drill sergeant-type character in the form of training supervisor Taro Minamoto (Tatsuya Fuji), a harsh taskmaster battling his own sea-related demons. The training he'll impose on these men lasts for fifty days, and each newbie is assigned a buddy with whom he'll be paired with throughout the experience. That decision will eventually prove to be the focal point of the storyline. Although it seems to be an ensemble piece at first, Umizaru isn't without a leading man. In this case, the main character is Daisuke Senzaki (Hideaki Ito), a working stiff with a taste for adventure. He also happens to hold a diving master's license, a fact which pegs him as "the one to watch" among his peers. Unsurprisingly, Minamoto pairs him off with Kudo (Atsushi Ito, later to be seen on TV's Densha Otoko), a weak, fairly diminutive diver-in-training who gives off the general impression that he'll be a washout in no time flat. Although never stated outright, it's suggested that Minamoto's rationale behind the odd coupling is to turn both men into better divers - Senzaki will learn to be a team leader, while Kudo becomes a solid diver in his own right. Well, that's the plan anyway. At first, however, these mismatched teammates find themselves tanking in the training exercises, primarily due to Kudo's poor diving performance. As a result, the two unlikely "buddies" end up suffering all kinds of demeaning punishments at the hands of their superior officer, and their failures earn the increasing ire of the already cold-as-ice Mishima (Ken Kaito), a supremely confident new recruit who's only looking to get ahead and couldn't care less about Minamoto's precious buddy system. Although the other recruits are initially snotty towards Kudo as well, the tide turns in his favor when he humbly admits his own weaknesses and reveals his true reason for becoming a diver in the first place. Moved by this gesture and Senzaki's dedication in making Kudo a better diver, all of the remaining recruits eventually decide to help Kudo succeed - all but Mishima that is, who remains thoroughly unconvinced of Kudo's merits. Meanwhile, the men make some trips off base and try their best to seduce local girls. However, they end up failing miserably since the "Sea Monkeys" have a terrible reputation among the female residents of this seaside town. It seems the new recruits always get new girlfriends when they arrive, but they also promptly dump them as soon as training is over. Even under these conditions, a few romances begin to bloom. Kudo takes a liking to a nurse named Erika (Karina), while Senzaki accidentally gets involved with her good friend Kanna (Ai Kato), a Tokyo-based fashion writer who's returned home to visit her ailing mother. The "Meet Cute" moment between the latter couple is decidedly embarrassing, as Kanna gets drunk, hits on Senzaki, and takes him back to a hotel room. She dozes off before anything sexual can happen between the two, but when Kanna wakes up the next morning she has no memory of the previous night and believes she's slept with Senzaki. Both irritated and delighted by Kanna's embarrassment, Senzaki is unable and perhaps unwilling to clarify the situation for her. Eventually, the two become friends and - you guessed it - much, much more. With both the action and the romance angles covered, Umizaru goes one better by adding a sizeable amount of comedy into the mix. Surprisingly, the humor comes off as disarmingly self-deprecating. That is to say, the fact that these trainees are depicted as dorky guys rather than preening, super-cool pretty boys is both refreshing and immediately endearing to the audience, even if the actors can be somewhat broad, if not over the top at times. But still, all the fun and games doesn't last as the Sea Monkeys are struck by an unforeseen tragedy - one so terrible that it shakes Senzaki to his very core. In fact, he's so bummed out by this sad turn of events, that he considers quitting. He's simply lost his nerve. Of course, this is a feel good action flick, so it's no secret that he's going to regain it, but how that plays out in the film is no less exciting, predictability quibbles aside. And once Senzaki gets things together, he soon finds both his skills and those of his teammates put to the test when an accident occurs on their final training mission. With no option in sight and backup too far away to get there in time, they have no option but to take matters into their own hands and find out if they really have the "right stuff" after all. When looking over the characterizations and the overall plot of Umizaru, the aforementioned Top Gun comparison isn't a glib remark; there's actually something to it. Senzaki is more or less playing the Tom Cruise/Maverick role, while Kudo proves to be "Goose" in ways you might not expect and Mishima clearly inhabits the Val Kilmer/Iceman character from Tony Scott's hit 1986 film. And it certainly feels like a 1980s Hollywood movie at times, as demonstrated when the song "Open Arms" by Journey plays not once, not twice, but THREE times during the film! And the first time it rears its head is during an overly saccharine movie kiss that's sure to elicit a few groans, and perhaps even laughter. It's just so darn cheesy. But that's not to say that Umizaru should be dismissed as either a Top Gun retread or a glossy recruitment film for the Japanese Coast Guard. The humor, the genuine likeability of its characters, and the overt "Japanese-ness" that colors the story trumps whatever deficiencies there are in terms of plot mechanics or originality. This is especially evident in the ending when the expected "overcoming insurmountable odds/winning the respect of a bitter rival" storyline is handled with a welcome degree of subtlety that makes all the action movie clichés a lot easier to swallow. Notes:  Followed by the TV drama Umizaru Evolution and a theatrical sequel, Limit of Love: Umizaru (AKA: Umizaru 2: Test of Trust).